Famous kids ruled the runway at New York Fashion Week 2017. Some of the celebrity children featured at NYFW included Cindy Crawford's daughter Kaia Gerber (Rihanna's Fenty x Puma, Marc Jacobs). Norman Reedus and Helena Christensen's son, Mingus Reedus (Calvin Klein). Bob Marley's granddaughter Selah Marley. Catherine Zeta-Jones and Michael Douglas's daughter Carys Zeta Douglas (Michael Kors). Lionel Richie's daughter Sofia Richie. 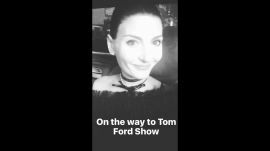 Magic Johnson's daughter Elisa Johnson (Tom Ford) and more! 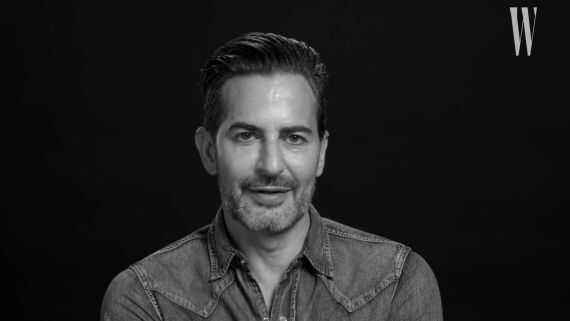 Marc Jacobs is proudly and openly gay, but he admits his first kiss was with a girl. He was 9 and at sleepaway camp and all the boys teased him for being gay. So, he grabbed a girl, a classmate named Lauren. "It was more of an 'I'll show you I can get a girl' kind of a thing," Jacobs concedes. "I wouldn't say the kiss blew me away. I wouldn't say it blew her away either!" 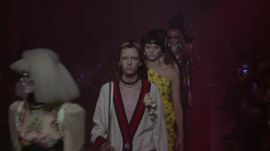 In his Screen Test with W magazine, Jacobs also recalls the grunge collection and names his favorite designers. On the streets of New York during the Fall 2017 collections, models and fashion insiders alike broke out their best winter layers to frolic in the city. 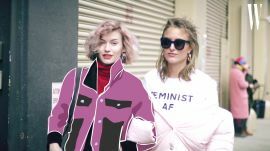 Pastels, puffer coats, and even a few delicate florals made appearances — and here, we reimagine them as bright, electrifying animations, channeling all the energy of New York Fashion Week. 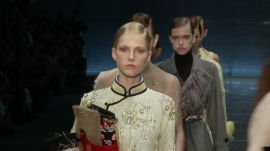 Go behind the scenes with Stefan Beckman, fashion’s favorite set designer – and Marc Jacobs’s 12-year partner-in-crime – at the Hammerstein Ballroom, which the two transformed into a rave-like, “Blade Runner” extravaganza complete with 1,500 lightbulbs, dry ice machines, and glittering pools of glycerin for the grand finale of New York Fashion Week Spring 2017.